Trump's trade thesis with China misses the boat. The iPhone provides an excellent starting point for discussion. As trade barriers break up, world-wide supply chains, the real costs are higher prices and fewer choices for consumers says Greg IP, my favorite WSJ author. Please consider That Noise You Hear Is the Sound of Globalization Going Into Reverse by Greg Ip. I reordered some paragraphs below. While globalization is routinely portrayed as bad for U.S. workers, the truth is more subtle. Routine, blue-collar jobs do get outsourced but high-end research, marketing and design work gravitates to the U.S.
Canadian steel uses iron ore from Minnesota, so Mr. Trump’s tariffs hurt both. About 17% of the value of Mexican-made cars exported to the U.S. originated in the U.S., according to Bruegel, a Brussels-based think tank. Beckett Gas Inc., family-owned manufacturer of components for boilers, furnaces and water heaters, has over the years shifted production from abroad to its Cleveland-area factories. By continuously improving its production process, it has avoided price increases and now sells all over the world. But that arrangement has been endangered by the 25% tariff on imported steel, the dominant input into Beckett’s products. “There are only foreign competitors to what we do,” Morrison Carter, the company’s chief executive, says. Those competitors now have a 25% cost advantage. Assembling an iPhone entirely in the U.S. out of American-made components would add up to $100 to its cost, according to a 2016 article in MIT Technology Review. This assumes, of course, Apple successfully relocates its supply chain. When, under pressure from the Obama administration, it began assembling computers in Austin, Texas, it encountered numerous quality-control and workforce headaches. Of course, supply chains that took years to take shape won’t change location overnight. Businesses still hope the protectionist wave burns itself out, and the logic of globalization reasserts itself. But a growing number are no doubt drawing up backup plans that look a lot like Harley’s. 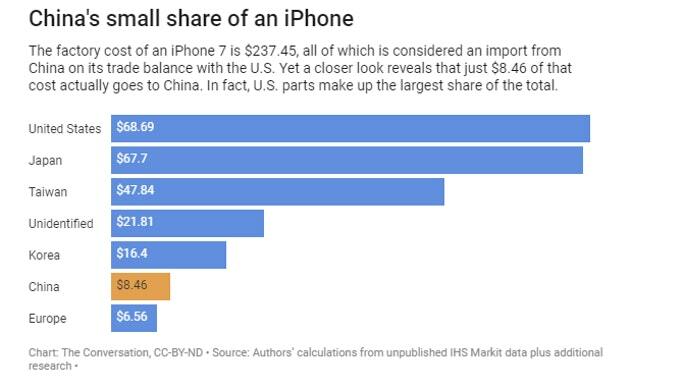 The Conversation reports We estimate China only makes $8.46 from an iPhone – and that’s why Trump’s trade war is futile. 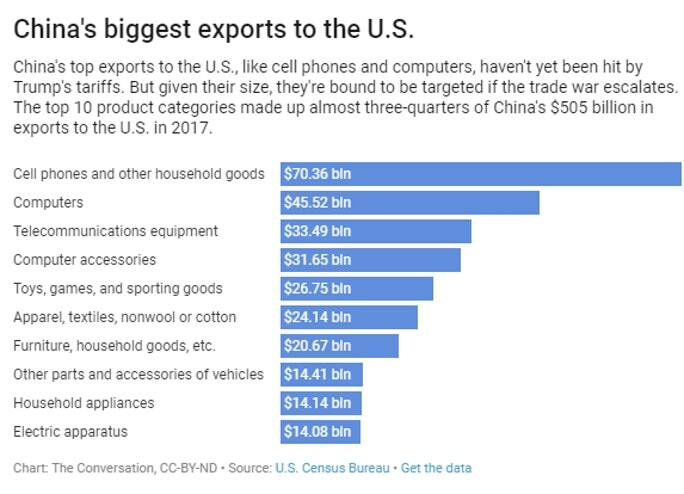 When an iPhone arrives in the U.S., it is recorded as an import at its factory cost of about $240, which is added to the massive U.S.-China bilateral trade deficit. IPhone imports look like a big loss to the U.S., at least to the president, who argues that “China has been taking out $500 billion a year out of our country and rebuilding China.” One estimate suggests that imports of the iPhone 7 and 7 Plus contributed $15.7 billionto last year’s trade deficit with China. The other $228.99 goes elsewhere. That's it. Of the $237.45 attributed to China as an import, China gets $8.46. The result is US imports from China are overstated by $15- to $16-billion on the iPhone alone. Trump understands neither trade nor supply chain math. The US is a huge beneficiary of China's role in assembling the iPhone. As per Greg Ip's article, the US benefits greatly from auto manufacturing in Mexico. In Trump Reverses Course, Promises "Great Trade Deal" With UK I posted this amusing chart. 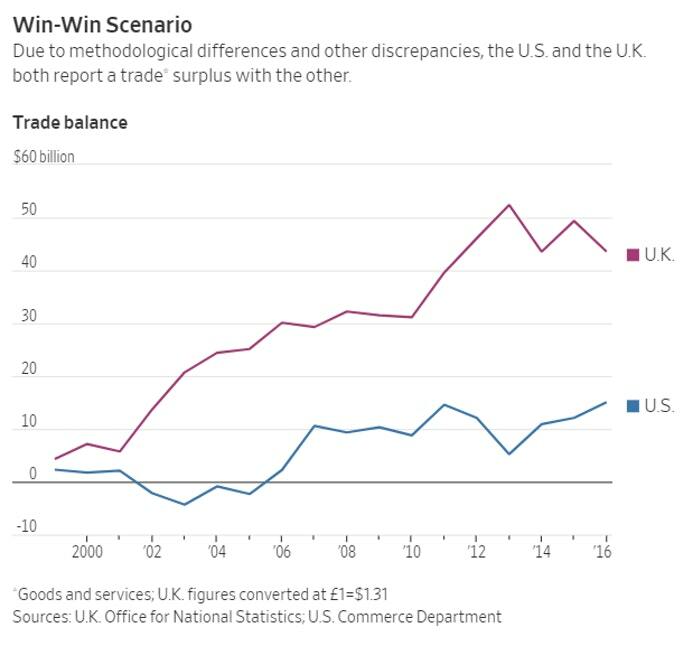 The US and and UK both claim to have a trade surplus with each other. Of course, that is impossible. And it highlights how silly these discussions are. I offered this "perfect solution". Change the methodology such that trade surpluses and deficits cease to exist anywhere. If anyone can do that, Trump surely can. My sarcastic comment aside, Trump's trade math is wrong on numerous fronts. Yet, even if corrected, the US will still have a deficit. As I suggested, let's revise the math to make it work, declare victory, and praise Trump for his brilliance (which is all his ego demands anyway). Then we can stop the trade war madness. Make trade math great again. That's all it takes.